Another late Sunday night in Brussels, another eurozone bailout plan for Cyprus — and it seems likely that the new deal between Cyprus president Nicos Anastasiades, and the ‘troika’ of the European Commission, the European Central Bank and the International Monetary Fund will endure much longer than last week’s disastrous plan, though capital controls to be implemented by the Republic of Cyprus’s government seem likely to lead to a backdoor eurozone exit for the nation of 1.15 million people. 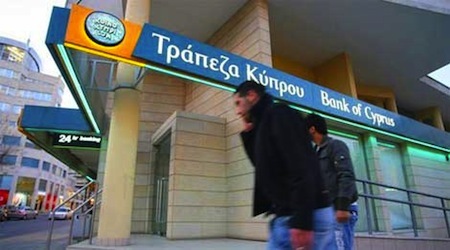 The deal will shield depositors with under €100,000 in savings from a ‘haircut’ levy, but depositors with funds over €100,000 now face an even more painful result –what amounts to a haircut for depositors and creditors alike at the troubled Bank of Cyprus (the largest Cypriot bank), and an even deeper haircut for Laiki’s depositors and creditors, who will take huge losses as Laiki is wound down. Laiki (also known as the Cyprus Popular Bank, the country’s second-largest bank) will be split into a ‘bad bank’ and a ‘good bank,’ the latter to be folded into the Bank of Cyprus. All creditors at the Bank of Cyprus will see their interests restructured into a long-term equity interest and uninsured depositors will take an expected haircut of around 35% or 40%, with their deposits also held up for some time to come. But there were two major injustices in the first Cyprus-Troika deal which made a mockery of the bail-in principle. Without debate, and upfront, it “taxed” depositors below the insured €100k limit alongside the uninsured. Then the tax was applied to either irrespective of bank. 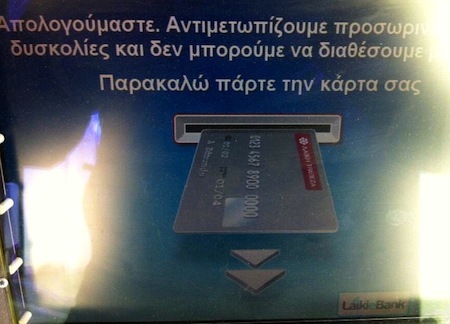 Why should small depositors in Barclays Nicosia or VTB Limassol take pain off large ones in Laiki or BoC, for instance. Well, finally, now we know. They shouldn’t have. The two unjust parts are gone. Bonus points, I guess (if you’re a eurocrat), for structuring the deal in such a way that it can be implemented directly under Cyprus’s banking authority, so no need for another vote from the Cypriot parliament, which overwhelmingly rejected last week’s plan. 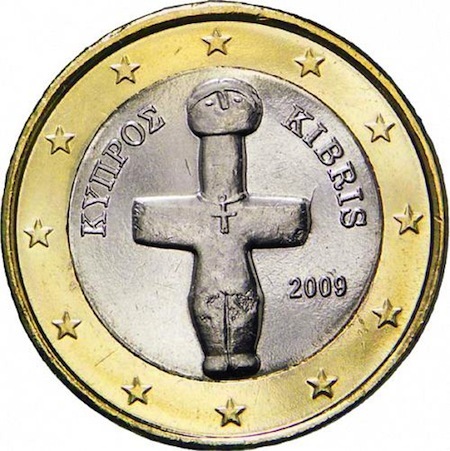 That plan featured a 6.75% levy on all depositors with savings under €100,000 in any Cypriot bank. The parliamentary run-around, however, will only fuel the ‘democratic deficit’ hand-wringers throughout the European Union and breed resentment inside Cyprus and beyond. Though the deal is ostensibly narrowed to focus on Cyprus’s two largest banks, and it’s better than last week’s plan, the deal essentially features the worst elements of the Irish and Icelandic examples. Like Iceland, some of the Cypriot banking sector will be allowed to fail — Laiki’s uninsured depositors are out of luck, no matter whether they are Russian or Cypriot or whatever. That’s exactly how Iceland approached its banking sector failure. But unlike Iceland, Cyprus does not control its own monetary policy, so it won’t be able to devalue its currency and take the kind of independent monetary policy steps to rebalance its economy in the way that Iceland has. Though Iceland is no longer the financial center it was before 2008, it has returned to GDP growth (around 3% in 2011 and 2.5% in 2012) and features relatively low unemployment — just 5.3% as of November 2012. In contrast, Cyprus remains trapped in the ECB monetary policy straitjacket. But like Ireland, the rest of the Cypriot banking sector will be essentially nationalized by the Cypriot government, with a European bailout that is likely to require additional bailout assistance and will come with increasingly stringent austerity measures that Cyprus’s government will be forced to take that will invariably depress its own GDP growth. No one’s optimistic about Cyprus — it seems fated to suffer a fierce GDP contraction and a massive uptick in unemployment, joining Greece and Spain as one of the eurozone’s most troubled economies, no thanks to the Eurogroup’s clumsy policymaking. It’s worth repeating that the damage from the first Cyprus plan remains and cannot easily be reversed — Cyprus’s banking sector has now been decimated, probably permanently. As one unsentimental Moscow economist put it, Cyprus’s beaches-and-banks economy is now just beaches. The best hope for Cyprus’s economy is the rapid development of natural gas deposits that could bost its economy back after what will likely be a double-digit recession. But the ultimate scope and richness of those deposits are still unknown, and there’s no assurance that natural gas will be the country’s economic savior. Brussels has so thoroughly undermined Anastasiades that he allegedly threatened to resign Sunday at one point, so it’s not clear how much legitimacy he’ll have in the next four years and 49 weeks of his five-year term, especially given that his own center-right party Democratic Rally (DISY, Δημοκρατικός Συναγερμός or Dimokratikós Sinayermós) controls just 20 of the 56 seats in the Cypriot House of Representatives (Βουλή των Αντιπροσώπων). In addition to the obvious ammunition that eurozone leaders have handed to euroskeptics, no one in Spain or Italy or Slovakia or Latvia should be feeling very good these days about keeping their money in national banks, deposit insurance or not. 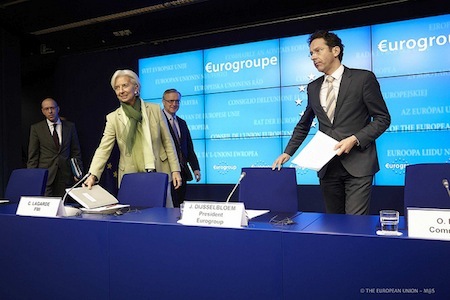 Already today, Jeroen Dijsselbloem, the newly elected president of the Eurogroup of eurozone finance ministers (pictured above with IMF managing director Christine Lagarde), has released a statement walking back earlier comments that appeared to hail the Cypriot bailout as a precedent for future deals. It’s been a horrible start for Dijsselbloem, who succeeded Luxembourg prime minister Jean-Claude Juncker — Juncker has already (very gingerly) criticized the Eurogroup’s post-Juncker approach to Cyprus, and it’s hard to believe that Juncker would have made some of the more glaring errors that Dijsselbloem has made — unlike Juncker, who was Luxembourg’s finance minister from 1989 to 2009 and has been prime minister since 1995, Dijsselbloem has served as the Dutch finance minister for barely over four months. It’s starting to look like the decision to appoint Dijsselbloem as a sort of compromise Eurogroup president (he’s a pro-growth member of the Dutch Labor Party who’s implementing an austerity regime in an otherwise budget-cutting government led by center-right prime minister Mark Rutte) may have been a poor one. While it’s far from an original observation — more sophisticated financial commentators and economists have made the same point — the biggest takeaway from the weekend is that Cyprus has essentially been booted out of the eurozone, in large part due to the capitol controls that Cyprus looks set to enact tomorrow when banks in the country reopen — here’s a short summary of the menu of options from Yiannis Mouzakis, based on the capital control bill that Cyprus’s parliament passed over the weekend. There’s optimism that the controls will be ‘very temporary,’ and will be somewhat lighter than originally feared, but it’s worth noting that Iceland’s controls are still in place even today, over four years after their imposition in late 2008. The inescapable conclusion is that a ‘Cypriot euro’ is no longer the same thing as a euro throughout the rest of the eurozone. After a couple of delays, Cyprus’s 56-member House of Representatives (Βουλή των Αντιπροσώπων) has rejected the European Union-led bailout of Cyprus’s banks by a vote of 0 to 36, with 19 abstaining and one not present. As I wrote yesterday, the parliamentary rejection became increasingly likely as the vote became delayed. The crisis continues to unfold in real time — although the bailout terms ( €10 billion loan to Cyprus, with an additional €5.8 billion to be raised by means of a haircut on all Cypriot depositors) were announced Friday night, Cypriot banks are now closed through at least Thursday while everyone scrambles for a Plan B. The European Central Bank has, for now, agreed to continue ‘its commitment to provide liquidity as needed within the existing rules,’ but who know what that means? 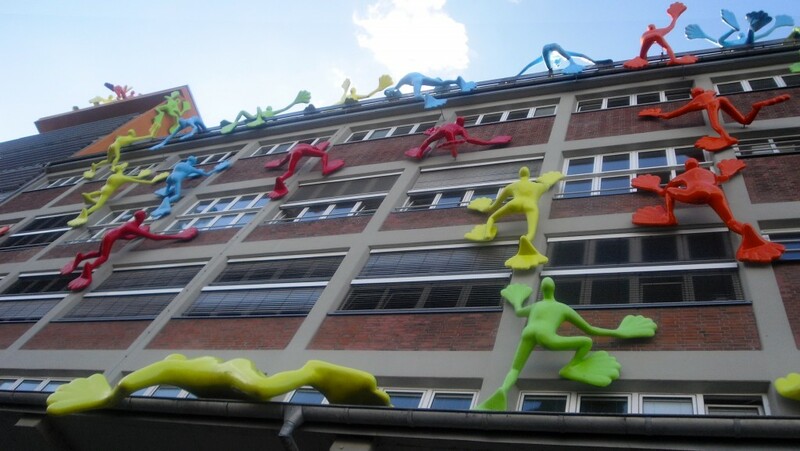 The current crisis started over the weekend when the ECB threatened to pull that support. Obviously, EU leaders and the International Monetary Fund will probably go back to the negotiating table with newly inaugurated Cypriot president Nicos Anastasiades to determine a new approach — the EU position now seems to be that they don’t care how Cyprus raises the €5.8 billion, so long as they raise it. Essentially, that means some kind of rebalancing of the burden to be shared by depositors in Cyprus — that means perhaps raising the 9.9% levy on deposits over €100,000 and lowering the 6.75% levy on deposits under €100,000. Meanwhile, there’s word that Cyprus and Russia are now in talks over, potentially, either a solution that involves Russia or Gazprom — Cypriot finance minister Michael Sarris actually flew to Moscow Tuesday, which indicates that the Cypriots and the Russians are extremely serious. In this regard, today’s vote probably bought some crucial time to come up with a credible counter-offer from Moscow. Russian president Vladimir Putin is, in particular, upset about the approach because around 22% of deposits in Cypriot banks are held by Russian citizens. That, in fact, is one of the reasons why the EU was so wary of providing a full bailout to Cyprus over the weekend. Russia has designs on future exploration of natural gas deposits in Cyprus, and it could also well have designs on a greater military presence in Cyprus as well. All of this has profound geopolitical security implications — for the EU and Greek Cypriots, but also for Turkish Cypriots, the United States, and its NATO allies, including Turkey. Whether Anastasiades is serious or not about the Russian alternative, it certainly gives him more negotiation leverage with the EU and the IMF, which could conceivably revert back to a full €17 billion bailout, via the ‘troika’ or through the European Stability Mechanism, as Open Europe notes in a great post. We’re also in such uncharted territory that if ‘EU Plan B’ or ‘Russia Plan B’ don’t work, then Plan C is pretty much a disorderly default that finds Cyprus tumbling out of the eurozone, with even greater pain for Cypriot savers, Russians depositors, and all of the holders of private and public Cypriot debt, to say nothing of the costs to the eurozone — now that EU minds from Brussels to Berlin to Helsinki have escalated the bailout into an international crisis, it could catalyze an entirely self-inflicted domino effect that would pretty rapidly bring the eurozone to 2008-crisis levels. So let’s hope we don’t get to that, though with the United Kingdom airlifting €1 million in cash to Cyprus to cover military personnel unable to access their own funds and with Russian ultranationalist Vladimir Zhirinovsky mock-eulogizing private property in the EU, the Cypriot situation has already reached a pretty high crisis mode. One question that I haven’t heard asked in the past 72 hours, and one I wish I had an answer: why hasn’t Moscow been involved in the Cypriot bailout talks from last June onward? It’s clear that there’s a Russian interest in an orderly bailout (or even selective default) for Cyprus and its debt-bloated banks. Russia has already extended a €2.5 billion loan to Cyprus, and Cyprus and the EU are dependent on Russia’s rolling over than loan soon if the current EU-led bailout to have any chance of working. Are the channels of communication between Brussels and Moscow really so poor? All of this was predictable nine months ago. Even if the EU ultimately blinks, it’s already done a lot of damage that it can’t well undo — it’s still the case that the EU has undermined Anastasiades just days into his administration, pretty much destroyed the short-term future of the Cypriot finance sector, undermined the concept of deposit insurance throughout the eurozone, given every euroskeptic on the continent a prime example of the anti-democratic nature of the EU project. Above all, the Cypriot crisis has undermined global confidence in EU leaders at a time when most everyone was certain that the worst of the eurozone crisis was behind us. The good news? No word of significant bank runs in Italy or Spain, though I’d love to see how much capital quietly leaves those two countries electronically in the two weeks following March 15. Photo credit to Yorgos Karahalis of Reuters. 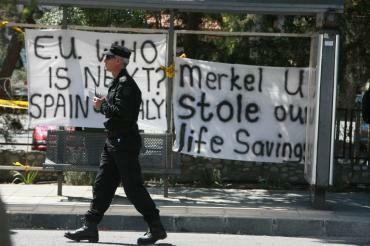 What comes next for Cyprus and the EU following Friday’s haircut ‘bail-in’? Fifteen days after his inauguration as Cyprus’s new president, Nicos Anastasiades (pictured above, bottom), was forced into what’s now become a growing domestic, eurozone and international crisis when European Union and International Monetary Fund leaders presented Anastasiades with a €10 billion bailout package. The catch, of which you’re almost certainly aware at this point, is that an additional €5.8 billion of savings will come in the form of a one-time levy on all bank accounts in Cyprus — deposits of €100,000 will pay a 9.9% levy and deposits of under €100,000 will pay a 6.75% levy, even those deposits are insured by a system similar to the FDIC guarantee in the United States. Senior bondholders won’t take a haircut. So if you’re a hedge fund, for now at least, you’ll receive fully 100% of the face value of any debt you hold in Cypriot banks. If you’re, say, a widowed Cypriot pensioner with €30,000 saved in a Cypriot bank, you’ll wake up Tuesday morning to find that you now have just €27,975. probably did nothing to help Cyprus’s long-term economic outlook, because if the levy weren’t enough to depress Cypriot growth and undermine its banking industry, further austerity designed to reduce Cyprus’s public debt is certain to send Cyprus’s GDP swooning for some time to come. That’s right — the first major decision of the Eurogroup of eurozone finance ministers since choosing as its president Jeroen Dijsselbloem, a center-left finance minister newly elected in the Netherlands just last autumn, is to demand an increase in the Cypriot corporate tax rate from 10% to 12.5% and a further increase on Cyprus’s savings tax. That’s in addition to the deposit haircut that everyone’s mostly focused upon. 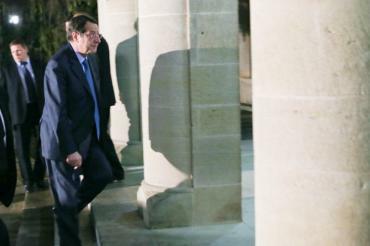 [Anastasiades] spoke on Saturday of a ready-made decision imposed on Nicosia in the form of a blackmail: Take it or have the eurozone crumble…. 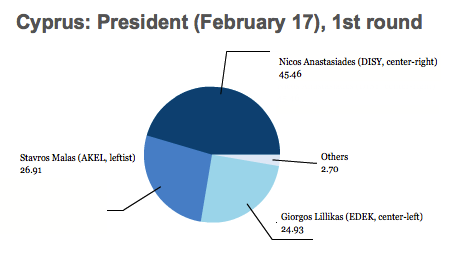 In the February 24 presidential runoff, Anastasiades won a landslide victory, with 57.48% of the vote to just 42.52% for health minister Stavros Malas, the candidate of the socialist Progressive Party of Working People (AKEL, Aνορθωτικό Κόμμα Εργαζόμενου Λαού or Anorthotikó Kómma Ergazómenou Laoú). Anastasiades, in an address to the nation Sunday night, meekly argued that depositors would nonetheless receive bank shares in return for the one-time assessment and remained optimistic that recently discovered natural gas deposits in Cyprus might well boost Cyprus’s banks in the near future. To the extent domestic politics is to blame for the current Cypriot crisis, AKEL is far from blameless — it’s unclear whether Cypriots will fault Anastasiades less than half a month into his administration more than his predecessor, Demetris Christofias, the country’s president from 2008 until last month. Christofias and European leaders opened talks in June 2012 to secure a bailout, and Christofias even began to implement some small reforms, including a 5% VAT on food and drugs and an increase in the bank levy and tobacco taxes, but fell far short of European demands to reform public employment, the public pension system, and privatization of state-run industries in a country where unemployment has now risen to 14.7%. In addition, the bailout talks were particular complex for other factors, including the outsized amount of the Cypriot banking sector’s debt, tied in large part to the Greek debt crisis. In addition, many Russian oligarchs have deposited money in Cyprus’s banks, and Cyprus has been scolded in the past for the facilitation of money laundering from less-than-pristine Russian sources. Merkel’s Finance Minister Wolfgang Schäuble had gone to Brussels with a firm mandate from Berlin: “no bail-in, no bailout”, said a member of her government. That meant: unless depositors took a hit, there would be no agreement and Germany would not contribute towards a package for Cyprus. So talks never quite progressed, and with Cyprus facing imminent sovereign default, Anastasiades came rather easily to office with a plan to renew those talks, though he repeatedly refused to accept a deposit haircut of the kind now being implemented. Although today was a bank holiday in Cyprus, banks were initially set to close on Tuesday, but will now be closed until Thursday as well, as the Cypriot parliament has repeatedly delayed taking up debate on the Cypriot package. Anastasiades’s DISY, as noted above, controls just 20 out of 56 elected seats in the Cypriot House of Representatives (Βουλή των Αντιπροσώπων) and AKEL controls 19. The centrist Democratic Party (DIKO, Δημοκρατικό Κόμμα or Dimokratikó Kómma), which backed Anastasiades in the presidential race, controls another nine seats. Three additional parties that largely supported the center-left, independent Giorgos Lillikas in the presidential election control an addition eight seats, including five by the Movement for Social Democracy (EDEK, Κίνημα Σοσιαλδημοκρατών or Kinima Sosialdimokraton). That means that if AKEL, EDEK and other small parties oppose the deal, DISY and DIKO hold just of 29 votes, just enough to pass the Cypriot package without any defections. Moreover, DIKO’s leader has already called for changes to the bailout legislation, and it looks increasingly like Anastasiades lacks the support to win a vote in parliament, which means that European leaders will have to renegotiate the previous deal. It’s not clear how much time Cyprus has before its banks (or its government) become insolvent. Russia hasn’t indicated whether it will extend or otherwise change the terms of an existing €2.5 billion loan to Cyprus — if Russia refuses to extend the loan for another five years, the Cypriot bailout will need to be even larger. So there’s that. I wouldn’t be surprised if Anastasiades and members of the Russian government are discussing an alternative to the current European-IMF plan — the Republic of Cyprus, which occupies the southern half of the island of Cyprus, is not a member of the North Atlantic Treaty Organization, and a €17 billion bailout would be a small price for Russia to pay in exchange for closer military ties or a Russian naval base on the island. Russia’s Gazprom has not offered the Republic of Cyprus financial assistance in restructuring the country’s banks in exchange for the right to gas production in the exclusive economic zone of Cyprus. Gazprombank initiated this offer, a spokesman for the gas giant told Tass. That result would cause dismay among the United States and its European and NATO allies which, by the way, includes Turkey. Turkey has occupied the northern half of the island of Cyprus since the 1970s — the Turkish Republic of Northern Cyprus declared its independence from the Greek Cypriot republic to the south in 1983, and the two have remained divided ever since. So what’s an economic crisis and a domestic political crisis could also become a geopolitical security crisis soon enough. Cypriot voters have selected a new president in today’s runoff, finishing the business they started last weekend in the first round of the presidential election. Nicos Anastasiades, the candidate of the center-right Democratic Rally (DISY, Δημοκρατικός Συναγερμός or Dimokratikós Sinayermós) has won 57.48% of the vote to just 42.52% for health minister Stavros Malas, the candidate of the governing, leftist Progressive Party of Working People (AKEL, Aνορθωτικό Κόμμα Εργαζόμενου Λαού or Anorthotikó Kómma Ergazómenou Laoú), which will likely jumpstart talks between Cyprus and the European Union over a potential bailout. Anastasiades nearly won the election outright last Sunday, when he garnered 45.46%, with just 26.91% for Malas and 24.93% for the independent, center-left anti-austerity Giorgos Lillikas. Once derided as ‘nasty Nic’ for his hot-tempered manner — he is alleged to have once hurled an ashtray at an associate — he’s been all ‘nice Nic’ throughout the campaign. The leader of DISY since 1997, Anastasiades was on the wrong side of a 2004 referendum when he supported the ‘Annan Plan’ to reunite the Greek and Turkish sides of the island; a majority of his own party and 76% of the Greek Cypriot electorate opposed the plan. His election today, however, marks a triumphant personal comeback. 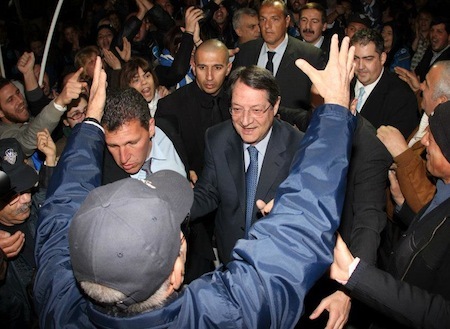 So what does Anastasiades’s victory mean? 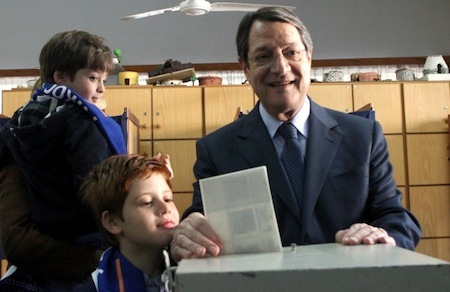 Center-right presidential candidate Nicos Anastasiades (pictured above) overwhelmingly triumphed in Sunday’s presidential election in Cyprus, outpacing his nearest rivals by nearly 20%. Nonetheless, he fell about 4.5% short of the 50% absolutely majority he would have needed to win the election outright and avoiding a runoff that will now take place next Sunday on February 24, despite early exit polls that showed he might win up to 52% of the first-round vote. So the question now is whether Lillikas’s voters will move en masse to Malas in the runoff or, alternatively, they will split between Anastasiades and Malas, thereby giving the center-right candidate sufficient support to win the presidency next week. Anastasiades has pledged to move forward as quickly as possible to secure a €17 billion bailout that Cyprus needs to avoid sovereign default in a country that’s seen its public debt rise to 140% of GDP. Although talks have been ongoing for over a year with the far leftist administration of outgoing president Demetris Christofias, the current administration has not been willing to implement the privatization of state industries that European leaders would require, though it has implemented tax increases and budget cuts over the past year. Those austerity measures have worn down the popularity of Christofias and of his party’s presidential candidate, Malas. At first glance, an alliance between Lillikas and Malas makes sense — both are generally to the left of Anastasiades, and Lillikas has campaigned on a platform of refusing to lead Cyprus into a bailout with tough conditions, arguing instead that Cyprus should rely on recently discovered offshore natural gas deposits to boost its public finances. Lillikas, a businessman and an independent candidate, was supported by several small centrist and leftist parties, including the center-left Movement for Social Democracy (EDEK, Κινήμα Σοσιαλδημοκρατών or Kinima Sosialdimokraton). Taken together, Lillikas and Malas polled nearly 6% more than Anastasiades in the first round, meaning that a majority of Cypriots appear to oppose the more austerity-focused bailout approach Anastasiades is very likely to pursue if elected. But in order to upset Anastasiades in the runoff, Malas would have to sweep up over 93% of Lillikas’s first-round voters. That seems unlikely, especially given that supporters of many of Cyprus’s political parties were split in the first round between Lillikas and Anastasiades, including the smaller Evroko (European Party) and Cyprus’s Ecological and Environmental Movement, both of which ultimately deadlocked over the issue of endorsing either Lillikas or Anastasiades. But that’s especially true of Cyprus’s Democratic Party (DIKO, Δημοκρατικό Κόμμα or Dimokratikó Kómma), a centrist party that most recently held the presidency under Tassos Papadopoulos from 2003 to 2008, under whom Lillikas served as foreign minister from 2006 to 2007. Although DIKO ultimately endorsed Anastasiades in the first round, many rank-and-file DIKO voters supported Lillikas, and that means it’s likely those voters will turn to Anastasiades in the runoff or, at least, abstain entirely from voting or protest-vote for neither Anastasiades nor Malas. Once derided as ‘Nasty Nic’ for his reputation as a mean-streaked and hot-tempered politician, Anastasiades’s victory today marks a remarkable comeback since he fell from favor nearly a decade ago after supporting the ‘Annan Plan’ that would have reunited the Greek and Turkish sides of the divided island of Cyprus — over 76% of Greek Cypriot voters opposed the plan in a 2004 referendum, despite Turkish Cypriot backing for the plan. The island remains split between the (largely Greek Cypriot) Republic of Cyprus and the (largely Turkish Cypriot) Turkish Republic of Northern Cyprus, following a 1974 Cypriot coup that led to an attempt by Greece to annex the entire island and a subsequent Turkish invasion of the north. Although the Turkish/Greek issue has not been a significant issue during the campaign, if he’s elected as president next Sunday, Anastasiades may well find himself on the wrong end of Cypriot public opinion once again, given that he’s indicated he’s willing to make tough sacrifices in order to secure a bailout for Cyprus. European leaders, including German chancellor Angela Merkel, have expressed support for Anastasiades, and it seems much likelier that Anastasiades could achieve a bailout deal for Cyprus. Merkel and other European leaders would be likely to demand extremely onerous concessions though, certainly no less than the concessions imposed on Greece. In light of the Cypriot banking sector’s less-than-pristine reputation on money laundering, it’s expected that a bailout would benefit dodgy Russian financiers and oligarchs whose money is currently deposited in Cyprus’s banks — a proposition that Merkel will likely find politically difficult with seven months to go until her own reelection campaign in Germany. EU economics commissioner Olli Rehn went on the record telling him that Cyprus is going to have to restructure its debt — just two weeks after ruling such a thing out. That might come as little surprise, given that Cypriot banks were loaded up to the gills with Greek debt, and Greek debt suffered a 70% haircut. Cyprus is tiny, and could never afford the €17 billion needed to bail out the banks and the government — especially since that would bring the country’s debt load up to more than 140% of GDP. Salmon cites a report from The Wall Street Journal‘s Stephen Fidler reporting from Davos. The Republic of Cyprus, with just over 800,000 people, is the third-smallest member of the eurozone (after Malta and Luxembourg), and it’s a relative newcomer to the single currency, having replaced the Cypriot pound for the euro only in January 2008, although the Turkish-controlled northern part of the island still uses the Turkish lira. The country accounts for just 0.2% of the eurozone economy, though its GDP per capita is a relatively wealthy $29,000, and it’s been in negotiations for a bailout for some time now. That hasn’t yet been successful, in part because of the unique legal, political and financial complexity of the negotiations. Rehn’s statement, if true, is essentially a declaration that time has run out — Moody’s downgraded Cypriot debt in July 2011 to junk status. Nonetheless, a €17 billion bailout would be dwarfed by the Greek bailout (€245.6 billion), the Spanish bailout in July 2012 to provide liquidity to Bankia (€41 billion), and even the bailout provided by the ‘troika’ of the European Commission, the European Central Bank and the International Monetary Fund of Romania that began in 2009 (around €20 billion). In many ways, a Cypriot default will be a key test for the European Union, given that it would be the first default since the treaty establishing the European Stability Mechanism formally came into effect at the end of September 2012. Unlike in Greece, where much of its debt is governed by Greek law, much of Cypriot debt is governed under various international law, which will make it a messier restructuring. Keep in mind, also, that the island of Cyprus remains split between the Republic of Cyprus (largely populated by Greek Cypriots) and the Turkish-occupied northern half of the island, the Turkish Republic of Northern Cyprus (largely populated by Turkish Cypriots). The island has been divided since a 1974 coup, Greece’s attempt to annex the entire island, and Turkey’s subsequent invasion, and the formal declaration of Northern Cyprus’s independence in 1983. 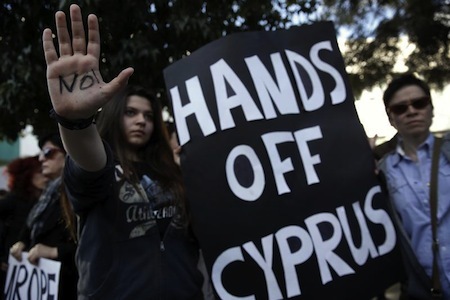 Add to that the fact that Cyprus is seen as a hub for worldwide money laundering, especially with respect to illicit funds from Russia, despite the protestations of Panicos Demetriades, president of the Central Bank of Cyprus, earlier this week. That means bailout proceeds could go directly into the pockets of some of Russia’s wealthiest oligarchs, a position that’s unlikely to go down well politically throughout the rest of the eurozone, especially as Germany gears up for federal elections later this year — German officials have even demanded that Russia contribute to any Cypriot bailout. Meanwhile, Cyprus will go to the polls in less than a month to replace Demetris Christofias, the country’s left-wing president since 2008. Unlike in many European countries with parliamentary systems, Cyprus’s president is both head of state and head of government. With a default (orderly or otherwise) on the horizon, Cyprus now faces a presidential election on February 17 — with a runoff, if necessary, a week later on February 24 — in the midst of a financial crisis and perhaps in the midst of bank runs. Christofias, who has presided over economic turmoil and an unemployment rate that’s now at 14%, has so far refused to engage in massive privatizations of state-run industries as a condition for a potential bailout. Add all of those factors together — the size of the Cypriot banking sector’s debt, the legal complexity of the debt, the Russian laundering issue, the complexity of the Turkish political reality with Northern Cyprus, and the leftism of the Christofias administration — and you start to understand why Cyprus is now allegedly headed to a default. It’s not been the best week for the new Greek government. Later this week, the key decision-makers of the European Union will be engaged in the latest attempt at ending the eurozone’s crisis at a conference in Rome. But the new Greek prime minister won’t be there. And neither will his finance minister, a post that may now be vacant. A week after his center-right, pro-bailout New Democracy won a narrow victory in Greece’s parliamentary elections, Antonis Samaras had emergency surgery over the weekend to repair a detached retina. Meanwhile, his nominee for finance minister, Vassilis Rapanos, the president of Greece’s national bank, has resigned (or turned down the offer — he was never formally sworn in) after falling ill on Friday and being rushed to the hospital. Newly sworn-in foreign minister Dimitris Avramopoulos won’t attend. Neither will Evangelos Venizelos, a former finance minister and leader of the center-left (and also pro-bailout) PASOK nor Fotis Kouvelis, the leader of the more leftist (and moderately anti-bailout) Democratic Left. Both PASOK and the Democratic Left are supporting Samaras’s government, but have refused to take any ministerial roles in the new government — indeed, both Venizelos and Kouvelis seem incredibly terrified that the staunchly anti-bailout and radical leftist SYRIZA will steal even more of their support base. SYRIZA placed a strong second in the June 17 elections and now threatens to displace PASOK as the dominant party of the Greek left. Greece’s president, Karolos Papoulias, will lead the delegation instead. Leading Greek newspaper To Pontiki calls out the government for its “sloppy handling” of Greece’s representation in Rome, but it is hard to blame Samaras too much for the unfortunate timing of two medical emergencies. But the incident marks an ominous tone for Greece at a time when the country seems to have days or weeks (not months) to shore up Greece’s position in the eurozone. After a campaign in which even Samaras agreed that the bailout package should be renegotiated in a way to help the Greek economy out of recession, it will be a massive blow to Samaras’s government that he will not be in Rome, nor will his initial choice for finance minister, nor will the leaders of the two parties that are his coalition partners. In other news likely to be depressing to Athens, the country with the largest exposure to Greece’s banks has now requested a bailout from the European Union as well — Cyprus needs €1.8 billion this week to shore up Cyprus Popular Bank. The amount, tiny by EU bailout standards, represents 10% of Cyprus’s GDP. Although the European Central Bank will want to impose some conditions on the bailout, Cyprus has also been talking to Moscow and Beijing about a cash infusion, making the Cyprus situation not only a financial headache for Athens, but a strategic headache for Berlin and Brussels as well (and it’s not as if the EU doesn’t have one or two problems that make even Greece seem like an afterthought).